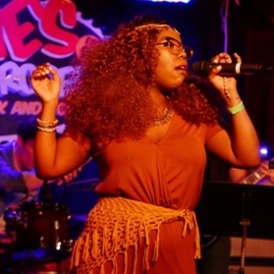 Nerika is an up and coming music artist with a sound described as alternative with a fusion of genres. Alternative music is a sound that is outside the mainstream that utilizes more original or electric sounds. She started sharing her voice when she was in preschool, then continued onto elementaryt school where she joined theatre as another opportunity to sing. And of course she was a member of her school's choir. “My music is a work in progress.” She states. At the beginning of her musical path, she thought she was going to be a jazz artist. As people try to find their niche in the world, their thoughts and plans are constantly changing and it is a game of self discovery. This is her favorite part of what she does. “Who am I? How can I be better?” she wonders. She has learned that it is okay to be different. Her experience growing up in the suburbs of New Hampshire gave people the idea that she is “not really black.” These influences encouraged her to stray away from her identity. Then it was music that brought her back. Her main infuence is her dad. He is the one who exposed her to the world of music and the arts, because in his free time he writes songs, stories, and poems. “The parts that make you different is what makes you dope.” She concluded. “Opportunities happen to you when they happen for a reason.” She claims that she likes to babble, but to me it was mezmerizing listening to her speak with such passion under the dim lighting and soft background music. A notable mark in her music career was getting into Clive Davis Institue, part of NYU Tish. Artists and scholars gather from around the world to study in the many subjects offered. They include acting, dancing, design, performance, film, animation, writing for music, theatre, stage, screen & television, perdervation, recorded music, photography, interactive media, games, and public policy. The admission process is rigorous due to the careful selection process to find the most intriguing applicants. "Once you’re here, you will encounter other people like you — people who have a deep curiosity about themselves and the world around them." She is thankful for making the connections that she has now is her greatest success. She started with no producers and no experience with music technology. However, her time at NYU gave her the necessary connections to start developing her brand. In her senior year of school Nerika has a final capstone project. This includes creating an EP and a developed image that she will then pitch to faculty. If she is successful in that stage, she then continues on to present infront of a board of executives that can propel her music career further. She plans on including a visual project to help illustrate her image. Just over the summer she shot a music video in Jamaica. “The ideas are there they just come when you don’t think about it.” She then continues to talk about how she came up with an idea for changing the hook in one of her songs while working at her retail job. This is good advice for anyone who finds their way in front of a roadblock. Maybe relax and take up meditation to clear the mind. “That’s when you are vulnerable. Those are your thoughts and your feelings.” After her alne time she is excited to work with instrumental musicians, producers, and engineers. Omari Clarke is a music producer, composer, singer/songwriter, event curator and graphic designer who attends The Institute of Audio Research in New York. He is studying digital marketing & distribution, music publishing, artist management, entertainment law, business planning, and concert production/venue management. "My first encounter with Nerika was at Blast Offproductions where we interned at the time." BLAST OFF PRODUCTIONS, INC. is a New York-based music production company and recording studio, located in the heart of midtown Manhattan. "Nerika performed at my last event "The Live Pop Up Shop" and killed it." Clarke said. "She is very professional and brightens the room with her glowing aura." Austin Crute, a 21 year old from Atlanta, Georgia, met Nerika their freshman year of college. Since then they have becom bestfriends and often worked together. "Working with her is a breeze and she loves to push herself and others around her to achieve the vision." Crute continues "Matter of fact, she lives and breaths exterminating negative energy from her personal, professional, and creative spaces. If you're looking for a fresh new artist or a positive energy, Nerika is what you're looking for. You can stream her music on soundcloud while we wait for her to hit the charts.